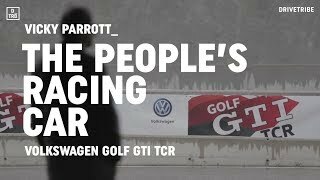 It was 2015 when Volkswagen took the curtains off its Golf TCR and now they mesmerized the arena with the sportive Volkswagen Golf GTI TCR 2016. Carrying resemblances with the GTR Concept, the model looks gorgeous and carries a powerful engine beneath its hood that will give the new power lovers a chance to hit the speed. Let us have a look at the review of Volkswagen Golf GTI TCR 2016 to learn more about it. 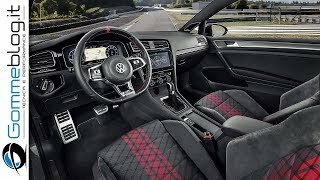 The interior of Volkswagen Golf GTI TCR 2016 is yet to release and nor we can get to a ‘definite’ prediction as neither the photographs are out, however company do shared few things. The model is expected to come with sports seats and safety cage with FIA-approved safety tank. Apart from the safety cage, buyers will also get the head protectors to make the ride safer and comfortable. Hearing these we can speculate to have a driver centric cabin with no nonsense, however having a bit of infotainment might add to the arena’s experience. Thus rounding up the interior details of Volkswagen Golf GTI TCR 2016 I would say expect sportive and comfortable inclusions. The exterior of Volkswagen Golf GTI TCR 2016 gets some really appreciative aerodynamic changes. Starting with the front fascia the sportive model is adorned with honeycomb grille amidst the headlights that you have seen in the Standard Model. However the large black inserts top and outboard side makes the model look aggressive. Getting to the rear fascia, along the sides, you’ll notice bit of extension of the wheel arches making them look wider and sportier while the side skirts add to the aerodynamic performance. The rear end has a massive spoiler over the hatch while the taillights carry resemblances but with a ‘GTI’ badge on the driver’s side unlike the front where we have the same on passenger’s side. 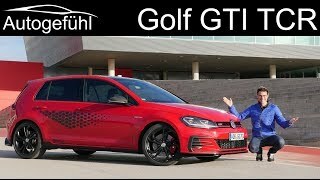 Thus rounding up the exterior details of Volkswagen Golf GTI TCR 2016 I would call it an impeccable work of engineering and style made to rumble the streets. Powering the Volkswagen Golf GTI TCR 2016 is a 2.0 liter four-cylinder turbocharged engine cranking total output of 330 hp and peak torque of 410 nm paired to six-speed sequential transmission with paddle shifters. 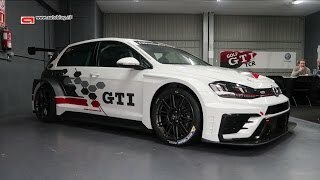 With this power and body kit, the top speed of Volkswagen Golf GTI TCR 2016 touches the mark of 143 mph and can sprint from 0-62 mph in just 5.2 seconds.